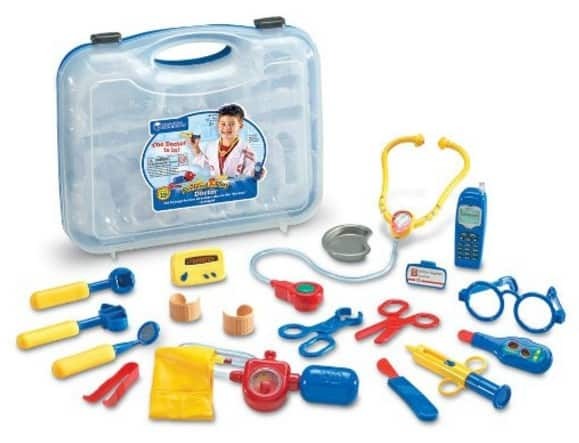 The Learning Resources Pretend & Play Doctor Set is on sale for $16.96 at Amazon right now. That's 54% off the list price of $36.99! 19-piece set includes stethoscope, pager, cell phone, forceps, 2 bandages, eyeglasses, name tag, scalpel, thermometer, tweezers, syringe, blood pressure cuff, scissors, reflex hammer, bedpan, ear scope, and dental mirror. Stores in plastic clamp-tight case. Frustration Free Packaging: this version comes in a brown corrugate box. Easy to recycle and great for the environment!